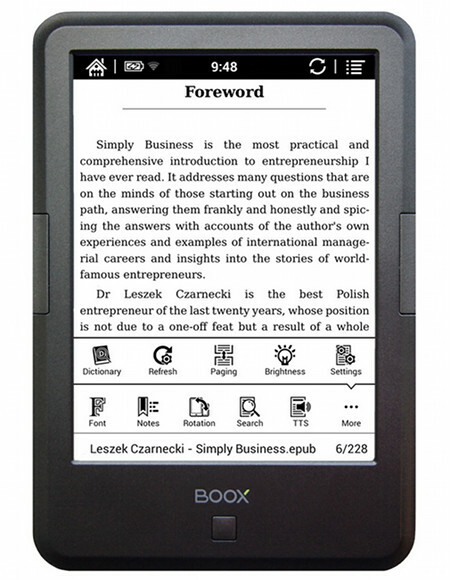 Back in November when Arta Tech first released the Onyx Boox AfterGlow 2, a 6-inch ebook reader with a frontlit HD E Ink screen and open Android 4.2, it was available exclusively from Onyx-Boox.com for 124 euros. Now Arta Tech has made the AfterGlow 2 more accessible by listing it on Amazon.com for $129 with free shipping (it’s also available on Amazon UK for £97). That’s a competitive price considering the amount of features the AfterGlow 2 offers. It’s about the same price as the Kindle Paperwhite, and adds some extra features like audio support, text-to-speech, a memory card slot, page buttons, and support for Android apps. The AfterGlow 2 has a 6-inch E Ink Pearl display with a resolution of 1024 x 758. It has a built-in frontlight and capacitive touchscreen. Under the hood the AfterGlow 2 features an upgraded dual-core processor that runs up to 1.2GHz, with 512MB of RAM and 4GB of internal storage space. The microSD card slot provides for further expansion up to 32GB. One of the main things that separates the AfterGlow 2 from other ebook readers is the open Android operating system. It runs Android 4.2.2 and unlike its nearly identical Chinese-imported cousin, the Onyx Boox C67ML, the AfterGlow 2 comes with Google Play onboard to easily download and install Android apps. I wasn’t going to review the AfterGlow 2 because I already reviewed the Onyx Boox T68 and Onyx Boox M96, but now that it’s available on Amazon I couldn’t resist. It will be interesting to see how it compares to the T68 and M96. The T68 is known to have some issues but the M96 runs really well. The updated software and faster processor on the AfterGlow 2 should make it the best of the lot. Check back next week for an early review. On paper it looks pretty good for the price; I’ll put it through some testing to see how it stands up. 6” inch E Ink Pearl display. Built-in frontlight (adjustable, can be turned on and off). Looking forward to the review, Nathan. Quick question for you: Do you know if and when Onyx will be releasing the i86? I haven’t heard anything about the i86 lately. This thread at MobileRead is the last I read anything about it. No, there doesn’t appear to be Bluetooth on this model. That’s US$1/£12 more than its price on Banggood (http://www.banggood.com/ONYX-BOOX-C67ML-4G-Wi-Fi-Android-4_22-E-ink-Touch-Screen-Ebook-Reader-Upgraded-Version-p-919433.html), which includes free *international* shipping. The one on Banggood also comes with a cover included, so that’s a bonus. The only problem with it is you have to root it to install Google Play, and if there’s a problem with the device return shipping would cost a fortune to send it back to China. If only it had bluetooth. Paired with an external mechanical keyboard it would be a perfect reading AND WRITING tool. I would be interested to see how it runs the Kindle and Nook apps. That looks like a good price, especially if people can use it to read their existing collection of Nook or Kindle books. The Kindle and Nook experience via Android apps on an eink screen is more than acceptable, but certainly isn’t optimal. The apps aren’t optimized for the eink display, so there’s lots of ghosting and screen flicker. Works fine, though, just not my cup of tea if I’m dropping 130 bucks. That’s what I am also looking for and am in the process of ordering this one. The flickering would be a deterrent and would put me off but there is a you tube review that seems to indicate that this is not present with the latest android update. Does anyone know? HI, WHENE IT WILL BE AVELABLE AGIN FOR PURCHASE? I’m interested in the audio player with this. Could you discuss or show us how that works? For some reason music players went out of fashion with e-ink readers. I hope this Boox version works well. Can’t hardly wait to see the review. Please, do not forget to include how this device deals with popular apps like Pocket and Evernote and if it is possible to copy a piece of text in a book and paste in Evernote. When will the review e coming ? It’ll be about another week before I get the full review posted. There’s a lot of stuff to test with these Android ereaders. New reader here. Mostly just showed up for the afterglow 2 coverage. Doesn’t seem to be much out there. Though if your review is enlightening, I might become a regular. FWIW. Sorry for the delay getting the review posted everyone. I haven’t been feeling well this month and it makes it hard to get any work done. I plan on having the review and video walkthrough posted this week. Sorry to hear you’ve been feeling ill, hang in there. =) I look forward to seeing the additional coverage whenever it hits. If possible, please test the Scribd app. @Marcelo, you may know this already, but the Kobo Aura HD (and several other Kobo models, check) has a built-in Pocket app. They do not say much about this, oddly, but it works beautifully, very quick all around (to receive, as a reader, etc.) It effectively turns articles into epubs. The Kobo browser also has a “Pocket” button. Thanks Johann! Do you know if it is possible to send by mail a piece of text from a book on Kobo? I agree with the others… where is the Bluetooth! I’ve been waiting for an e-ink tablet that can run instapaper, without much in the way of hacks or compromises, and sounds like this might be it! I’m new to the site, just stumbled upon it tonight. Look forward to the review.